It seems like it’s snowing all across the U.S. this weekend, so I thought what better way to pass the time indoors than to crochet some snowsquirrels and snowacorns like those on our new winter banner. Read on to discover how you can make snowsquirrels and snowacorns out of yarn (in case you’re just not in the mood to make them out of snow). P.S. It’s been brought to my attention that the New Year’s video didn’t show up in the email last Wednesday, which is a shame because it really is rather cute. If you’d like to see how Hodge and Podge and the fatimals rang in 2014, you can view the short film on the website. Sorry about that. To make snowsquirrels, use this snowman pattern by The Dapper Toad. To make a snowman into a snowsquirrel you’ll need a tail and ears too. For the tail, make another snowman but replace “Rows 11-13: sc around” with “Rows 11-15: sc around.” Then continue pattern as written. Stuff lightly. As you’re stuffing the tail, rework the shape by flattening the bottom and rounding the top. Sew the tail to the back of your snowsquirrel. Make 2 ears from my squirrel pattern and attach to the top of the snowsquirrel’s head. I also used The Dapper Toad’s pattern for the snowsquirrels’ scarves. To make snowacorns, use white worsted-weight yarn and my pattern for acorns. To make hats for your squirrel friends, follow my pattern for a squirrel head, Rows 1-8. Use a slightly larger hook: size H-8 (5.00 mm) or I-9 (5.50 mm) should do. 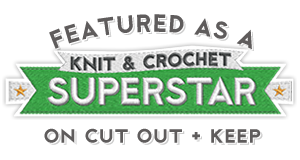 Categories: Banner Dioramas, Crochet It, Hodge & Podge | Tags: acorns, crafts, crochet, diy, scarf, snow, snowmen, squirrel, squirrels, winter | Permalink. Yay! I want to make hats for my squirrels!! Thank you! You’re welcome, Grace! I bet Liv and Andy will look very dapper in their hats. Super Cute Banner. Happy New Year. Lovely patterns and I got my video just fine. 🙂 I must have got email alert and then went to webpage. Yes it will be fun. Keep an eye on your letterbox for samples! 🙂 I am starting the bare nosed Wombat next week. You are so awesome! This is so exciting. I’m glad I have a year to work on it. I hope I can present your native land accurately. I’m so glad I have your help!